They warned me this would happen. I told myself I wouldn't do it. And yet, I did and they were right. Darn those "experienced moms" who've been there and done that. Just last night I brought him home from the hospital and got up at least 8 times during the night to make sure he was still in the bassinet at the foot of our bed. During one of those middle of the night feedings I did the forbidden.... 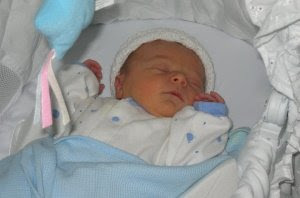 I blinked...... and now the baby I kissed goodnight is four years old!! How could it have happened so fast? I was just learning how to nurse in public without flashing the world and now he's flying around my backyard like a super hero protecting me from bad guys. At this rate I will be attending his high school graduation tomorrow. How do I bottle up these moments? How do I make time stand still? I want to slow down, it's going by way to fast. I know I am tired. And by the end of the day I often want to rush through the bed time routine so I can have some peace and quiet before the day begins again. But I love these days. I love that my son wants to sit beside me at dinner and have me sing him his lullaby before bed. I love our snuggle time on the couch watching Curious George. I love his giggle when I say some silly word like, "but but" and his enthusiasm about planting seeds on his birthday. I love baking cookies with him and singing, "Sugar, dada-da-da-dada-Oh honey honey" when we measure and pour the sugar into the bowl. I dread the day when he no longer thinks my way of doing things is THE RIGHT way to do it, or when he no longer goes to sleep clutching that days most prized object (be it a sword, or pumpkin, or watering can). So the next time he reminds me we haven't had any snuggle time today and I am in the middle of e-mailing or unloading the dishwasher, I am going to remember that these moments are fleeting and I will revel in the fact that he still wants to share these moments with me. Happy Birthday dear Son. I am so glad God made me your Mommy! i love that kid. 4 already? can it be??? I am still crying over this one - even after reading it 3 times.